Unlike many reviews I've read of this film, I'm not really in a position to wax nostalgic about the glory-days of grindhouse cinema. I've never been to a double feature, nor do I pretend to be well versed in pre-1990's underground cinema. What I do recognize is that Grindhouse exemplifies exactly what movies are supposed to be; a genuinely fun piece of escapism. Rodriguez and Tarantino deliver what I can only assume is a faithful homage to a genre which inspired them. In some ways, they've been making grindhouse movies all along, these are just the first to embrace the influence unabashedly. Rodriguez's contribution, Planet Terror, tries to be a campy zombie-horror epic, but inadvertently ends up making you actually care about the fate of the diverse cast of broadly drawn characters. There's the one-legged go-go dancer (not a stripper), the criminal with a mysterious past, an over-zealous police chief, the abused wife, and the Texan BBQ cook. Drawn together by the onslaught of a mysterious all-consuming virus which endows those infected with a hunger for human flesh, this group of unlikely companions go on the requisite quest to save the world. Blood and gore abound, gigantic explosions engulf the screen, and guns take the place of missing appendages. But the tale Rodriguez spins (as well as the story he leaves out, thanks to a missing reel) transcends it's formulaic approach, injecting humor and an uncanny realism into its seemingly constricting confines. In some ways, this take on a characteristically 'fake' genre ends up seeming more real than many of the films making their way out of Hollywood today. Tarantino's effort is another animal altogether. 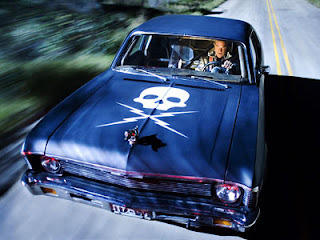 Conceived as a tribute to car chase movies like Vanishing Point, Death Proof ends up being more of a Tarantino film than grindhouse cinema. The exposition is excruciating at times, consisting mainly of drawn out conversations with little relevance to the overall plot, think Reservoir Dogs with a group of four girls replacing the men in suits. This verbosity is taken to many different venues, from cars, to restaurants, to bars, but it never seems at home in a film that is supposed to be about over-stated action, not mindless ramblings. The first of homicidal Stuntman Mike's high speed kills sates the audience's appetite for spectacle, but only after having to wade through half an hour of (mostly pointless) dialogue. The climax takes just as long to come, as viewers are subjected to yet another long stretch of a new group of four girls babbling on about the mundane. The characters are such stereotypes that the conversations don't even do anything to flesh them out. We get it; the actress is dumb, the stuntwoman is fearless, the black woman is a hardass, and Rosario Dawson is just along for the ride. But once the car chase gets started, it almost seems worth the wait. The speed, the roaring engines, the clash of metal on metal, and the total absence of CGI make the last 20 minutes a visceral experience that is arguably the best car chase captured on film in quite some time. It almost makes the lead-up forgivable, but as a follow-up to the bombast action of Planet Terror, it's somewhat of a let down. A simple swapping of positions would have done wonders. I can't end the review without mentioning the fake previews which are interspersed before and between the films. Rodriguez's trailer for the 'mexploitation' flick Machete is hilarious, and may actually receive a direct to DVD release if time can be found to shoot it during the filming of Sin City 2. Eli Roth's promo for Thanksgiving comes in a close second, a great riff on holiday-based slashers like Halloween (coincidentally, the REAL trailer for Rob Zombie's upcoming Halloween remake was shown before the film). The other trailers, care of directors Edgar Wright and Rob Zombie fail to impress quite as much, likely due to cuts to keep the rating of the film under an NC-17. A very nice touch to a movie that's practically dripping with nostalgia. It's kind of sad to see that a movie starring Ice Cube beat out this film at the box-office this weekend. If you haven't seen it yet, get out next weekend and make sure that doesn't happen again.